Cenote comes from the Mayan word “dzonot” or “ts’onot” which means sacred well. Cenotes were the main source of fresh water for the ancient Mayan civilization. Mayans believed the cenotes contained curative elements and considered many of them to be sacred. They also believed cenotes to be portals to the underworld and a way to communicate with the gods. The Sacred Cenote (Cenote Sagrado) at Chichen Itza was used to perform human sacrifices! Some of these beautiful natural sinkholes are open to the public. Here are the best cenotes to visit in the Yucatan Peninsula state of Quintana Roo. They are all located relatively close to Cancun and Playa del Carmen. 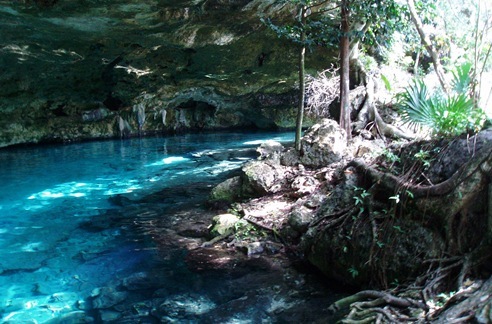 Called the “Sacred Blue Cenote”, Ik-Kil is a crystal clear, round, well-type cenote. Located on the highway between Chichen Itza (it’s only a couple of miles away from the archeological site) and Valladolid, this cenote is about 130 feet deep! It is about 85 feet from the surface so you will need to walk down a wooden stairway to reach it. Ik-Kil is more popular with swimmers and snorkelers than divers. There is a restaurant and small palapa homes for overnight stays. Look for the waterfalls and the lush green vegetation hanging all the way down to the water! Cenote Ik Kil is located 3 km from the archaeological site of Chichen Itza. Cenote Dos Ojos or “two eyes” is located a little over 9 miles south of Tulum on highway 307 on the right. This cenote was named Dos Ojos because it is actually two circular cenotes. There are areas for swimmers, snorkelers and scuba divers. This is a world famous cenote and there is a large cave system below where divers can explore almost 500 meters of the underwater world in the immediate area. IMAX filmed part of their film “Journey into Amazing Caves” here. There are bathroom facilities and snacks available. Look for the “Bat Cave”! Cenote Dos Ojos is located about 15 minutes north of Tulum off Highway 307. This cenote lives up to its name (gran = grand or large) and is a must see. Located just outside of Tulum, it is easy to find. Take a right off of highway 307 at the second stop light in Tulum. After traveling almost 2 miles you will see a sign for the cenote on your right. There are changing and bathroom facilities and a restaurant. There are areas for swimmers, snorkelers and scuba divers. Look for the fish and turtles and be careful not to hit your head on the impressive stalactites! Many people say this is their very favorite cenote. Gran Cenote is located 3.5 km from downtown Tulum on the road to Coba. 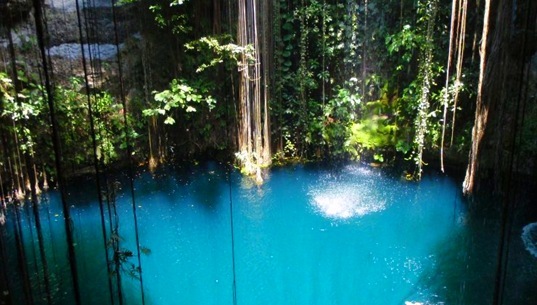 Mexicans, expats and tourists all love to visit the beautiful cenotes of the Mexican Caribbean. They may spend the day swimming, snorkeling, diving, sunbathing or simply relaxing. Visit a cenote and you may even connect with the ancient Mayan civilization. Book our Chichen Itza Mayan Ruins Tour. Book our Cancun All-Inclusive + Chichen Itza Tour. Have you been to a cenote? Which one was your favorite? Any tips? Share your thoughts in the comments below. I have NEVER been to a cenote but I would love to go!! I’ve never been, but hoping to on our trip to Cancun. I have always wanted to snorkel in a cenote! I have never been to a Cenote but I would love to go! I love how dark and eerie it is, the one I visited on my trip to Chichen Itza. I have never seen a cenote. My wife loves photography, so this would be a great place for her to take photos of the family. I visited one on the way to chichen Itza last year and it was amazing. Have great pictures too ! I would love to see the cenotes!! I have never been to a cenote, but I would love to go. Such a beautiful serene area of nature, unlike anything we have in Washington! I posted 2 pictures on Yucatan Holidays facebook Wall. Wow, these pictures are gorgeous! I would love to see some of these. Thanks everyone! 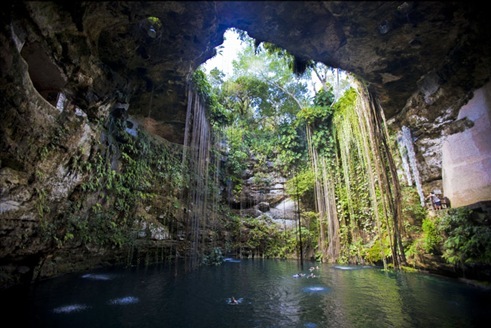 Winners, enjoy your prize…and these beautiful cenotes! Would also add the cenote at Ek’ Balam to the list. Rope swings + spectacular Mayan ruins + giant fresh water hole = Mucho fun. Thanks Pawel! Will definitely look for it for an upcoming post! Snorkeling in a denote is on my bucket list. This post has helped me with planning a future trip to Riviera Maya. Hi, nice article.Here you have the ranking of the cenotes.